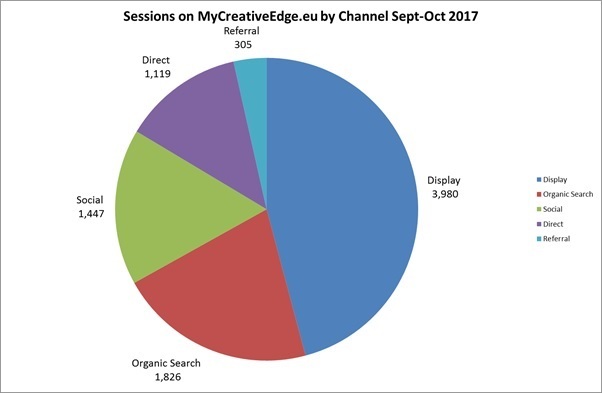 In early September we updated MyCreativeEdge.eu members on the results of our Summer digital marketing campaign during July and August. We now want to let you know what happened during our Autumn campaign in September and October. One of the big changes was the addition of Google Display Ads, to the Facebook and Instagram ads used over the summer. The campaign targeted consumers based in the five MyCreativeEdge.eu regions and the capital cities of those countries – Dublin, Stockholm, Belfast, Reykjavik and Helsinki. In addition cities in the UK, US and Canada were targeted. During the two months (Sept-Oct), there were 8,680 unique sessions (visits to the site) on the MyCreativeEdge.eu website from 6,538 unique users (individual visitors). This was a 100% increase in the number of sessions since the same period a year previously, and a 2.8% increase from the previous two months, when the Summer campaign was running. 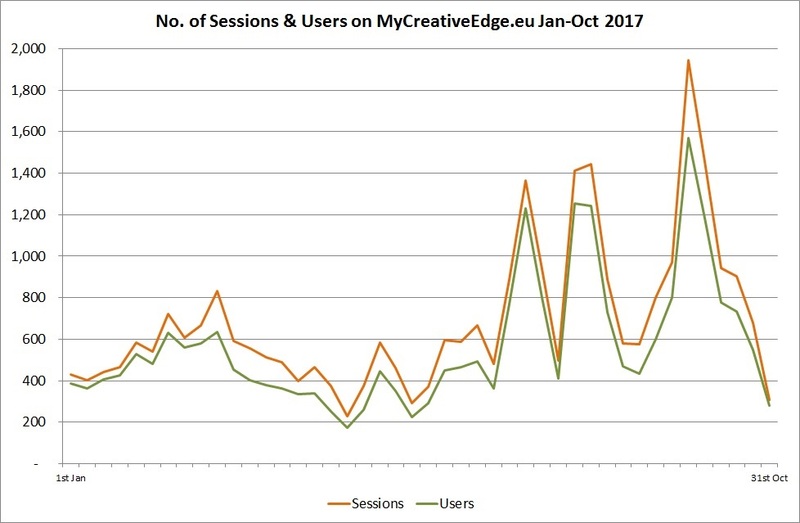 Below you can see the number of sessions and users to MyCreativeEdge.eu each week from 1 January to 31 October 2017. The site received over 30,000 sessions over that period and the impact of the digital marketing from July onwards is clear. Over 86% of the sessions were from new visitors, while returning visitors increased by 140% from the same period last year. Returning visitors spend an average of just over 4 minutes on the site showing that site members, as well as others familiar with MyCreativeEdge.eu, are engaging with the site. The average length of time spent on MyCreativeEdge.eu was 1.51 mins which is slightly longer than in July/Aug, a positive trend. During the Autumn Campaign period, about two-thirds (65.5%) of sessions were from a mobile or tablet, a major change from the same time last year, when only 38.8% of sessions were through a mobile device. Ireland and the United Kingdom continue to be the largest source of site sessions, but the audience in other targeted countries has grown far more strongly as a result of the Autumn Campaign. At 3,980 sessions, Display (Google Display Ads) was the largest source of sessions to the site during Sept-Oct. This was the first period that this advertising was used. Of the 1,447 sessions that came from Social during Sept-Oct, 82% came from Facebook. The most viewed pages were the ‘Showcase’ pages where links in ads were directed. The Crafts showcase page had the most page views (2,286 views), followed by the Home page (1,794), Home & Gifts (932), Fashion & Accessories (768) and Arts (735). From the Showcase pages, visitors can select to view any Profile from that sector and we’re delighted to see that a number of Profiles from different regions were among the top 10 pages in terms of unique page views. Among these were Finnish artist Jonna Lamminaho, Irish knife-maker Smyth Knives and Wild Cocoon Hand Woven scarves. As well as the member Profile pages, site visitors seem particularly interested in stories about opportunities for creative enterprises such as the Finnish photoshoot and Creative Steps 2.0. And our In Profile interviews with #mycreativeedgers working across the regions are always popular. Interviews with Icelandic artist Yst and Irish upcycling business LX-upcycle were top performers. We’ve just launched our new Christmas campaign targeting those looking for a truly unique, handcrafted Christmas gift. So if you see our ads, remember to Like and Share! And if you’re not one of the 231 creatives from Europe’s Northern Edge who have published a free Profile on MyCreativeEdge.eu, this is the perfect time! In the New Year we’ll start our Paid Search campaign promoting our MyCreativeEdge.eu members who are providing services to businesses and consumers.